POWER ANIMALS come into our lives for specific reasons. When we are challenged, doubtful about our future, or experiencing lack of direction in our lives, a Power Animal is eager to support us with their specific Medicine. Be it PROTECTION, WISDOM, GUIDANCE, HEALING, or STRENGTH. Example: If you are concerned about finances, Squirrel who is the financial guru of the Animal kingdom will come to assist you. 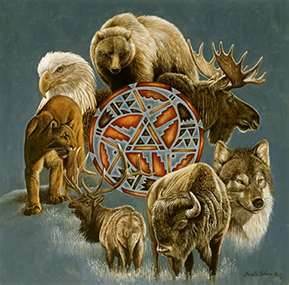 Unlike our Totems on our Medicine Wheel who stay with us for life, Power Animals come and go as we need them. The Native Peoples of many cultures are familiar with working with the Animals and the incredible gifts/medicine they share with us. Do join me for this sacred drumming journey of awe and wonder where you will travel to meet and greet your personal Power Animal. Time: 7.00 P.M. – 9 P.M. Your workshop facilitator Sharon de Ryck is a life student of the great Mystery of Life, Reiki Master/Teacher, Certified Reflexologist, Holistic Wellbeing Facilitator (Meditation & Visualization for Stress) and Law of Attraction Mentor with a private practice in Newmarket, Ontario. Sharon believes in empowering people to grow and become more than they ever thought possible. I am interested in participating in your Power Animal Workshop. Can you please provide me with details. Unfortunately I will be away in Oct. I really wanted to join the animal totem workshop. Please let me know when you hold another similar workshop. Thank you. I am interested in participating in your full moon circle &; your power animal workshop, if you can let me know when your having your next class.